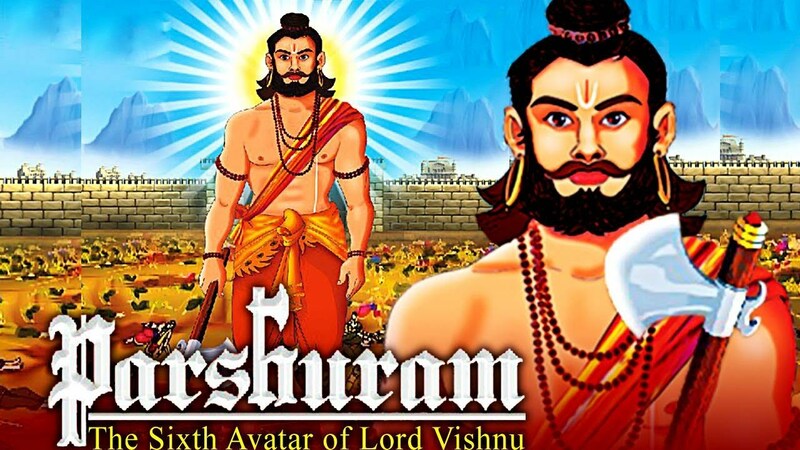 Synopsis - Parashurama परशुराम is the sixth avatar of Vishnu in Hinduism. He is the son of Renuka and one of the saptarishis Jamadagni. Parashurama grew up to be a powerful youth. Parashurama devoted himself in serving his parents and brothers helping Jamadagni to run his hermitage. As Rama grew older he was sincere in his piety and pleased Lord Shiva with the oblation of excruciating tapas. As a blessing he was granted the Parashu of Shiva after which he was known as Parashurama or 'Rama with axe'. Shiva also granted the boon of invincibility to Parashurama. Kartavirya Arjuna had a 1000 human arms endued with tremendous strength and dexterity. Despite being a wise and righteous king Kartavirya became arrogant as he never lost or failed in anything. King Kartavirya of came upon the hermitage of Jamadagni. The King had a massive entourage but the saptarishi was able to serve the King a grand feast. When Kartavirya asked how he was able to do so Jamadagni showed him a blessed Kamadhenu cow given to Jamadagni by Indra which was able to grant wishes. Kartavirya's ministers urged the king to steal the cow. Jamadagni refused to part with the cow despite being offered tremendous wealth. The evil Haihayas forcibly stole the cow. Returning home Parashurama was infuriated upon learning what happened and rashly swore that he would exterminate the race of Kshatriyas. Parashurama headed towards Mahishmati to slay Kartavirya. Parashurama reached the outskirts of Mahishmati and sent a message to Kartavirya either return Kamadhenu or death on the battlefield. Outraged Kartavirya summoned billions of kings who were his allies. Parshurama ascended on a single chariot and without any ally marched against the formidable Haihayas. War broke out and Parashurama began to wreak havoc. Fighting continuously for three days Parashurama slew all akshauhinis. Then Kartavirya himself with a thousand hands and five hundred bows mounted on a colossal golden chariot drawn by a hundred horses proceeded against Parashurama and both fought one another. The two rivals hurled Brahmastras at each other. Parashurama hacked Kartavirya's thousand arms. He invoked the Pashupatastra and decapitated the king incinerating him to ashes. Thus Parashurama slew Kartavirya Arjuna. Parashurama slaughtered the remaining kings and allies of Kartavirya and routed the Haihayas emerging victorious and returned with the Kamadhenu cow. When he returned home his father was pleased but seeing the blood stained axe of Parashurama also concerned. Parashurama accepted the reprimand of his father in penance and went on a pilgrimage to holy places for one year in purification. Meanwhile the sons of Kartavirya traveled to the hermitage and murdered Jamadagni discharging arrows into him like killing a stag. Afterwards they decapitated his body and took his head with them. When Parashurama returned home he found his mother next to the body of his father crying hysterically. Furious he hunted down the sons of Kartavirya at the palace. He killed them all and returned with the head of his father to conduct the cremation. Parashurama then vowed to enact a genocide on the war mongering Kshatriyas twenty one times over once for each time his mother's hand hit her chest. Parashurama then travelled the whole of Earth killing all men of the Kshatriya varna. Parashurama played an important role in both Ramayana and Mahabharata. In the Ramayana Parashurama had given the bow of Shiva to King Janaka the father of princess Sita for her swayamvar. None were successful until Rama but in the process of being strung the bow snapped in half. This produced a tremendous noise that reached the ears of Parashurama as he meditated atop the Mahendra Mountains. Parashurama stops the journey of Sri Rama and his family after his marriage to Sita. He threatens to kill Sri Rama and his father. Parashurama invokes Sri Rama for a challenge. Sri Rama proves to be equal with him in all common weapons. Hence Parasurama gives him the divine Sharanga bow and tells him to string it. Rama does that in a blink and points an arrow at Parasurama. The warrior sage realized he was looking at his own subsequent reincarnation and gives his divine weapons to Rama and retires to further penance. Karna was brother to the Pandavas and the son of Surya. Karna lies to Parashurama that he is a Brahmin. Parashurama then accepts him as his student and teaches him of all the powerful Brahmanda astra weapons. Parashurama trains Karna to such a point that he declares Karna to be equal to himself in the art of warfare and archery. One day Parashurama realized that Karna had lied and cursed his student that his knowledge would fail him when it was most crucial. Years later during the Kurukshetra war Karna dies at the hands of Arjuna.